Did you know that Carnaval in Rio actually lasts until the Sunday after Ash Wednesday? You did? Well, you're smarter than I am. I was sure we'd get to Rio and find only the corpses, but there was still a few sparks, a few straggling revelers. There were also quite a lot of paint-slathered youths collecting money after getting into medical school. We saw them in Leblon and also on the island of Florianòpolis. Congratulations to you all and sorry I didn't have any reais for you! When I returned to Munich, a student of mine asked me if I'd felt safe in Rio. Apparently there was a police strike while I was there and lots of murders. Honestly, I felt safer in Rio this time than ever before. The last time I was there, two people threatened to kill me, a crazy woman grabbed me and started shaking me, and somehow I ended up in a very rough dance club one night. Ah, those were the days. The Copacabana is cleaner now than it was eight years ago, and I'm happy to report that the Brazilians are a bit fatter. I've always been intimidated by the fit, brown bodies of the guys playing foot volleyball on the beach. Don't get me wrong. They're still fit, but there are also lots of flabby-bellied people on the beach now too. Comforting, no? What's not comforting? The prices in Rio. Eight years ago the exchange rate between the euro and the real was around 6 reais to 1 euro. 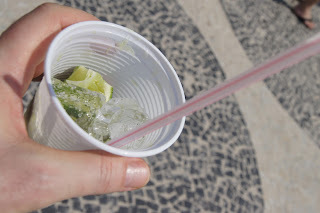 That meant that a caipirinha on the Copacabana cost around 1 euro. Ah, those were the days. Now the cheapest caipi will set Europeans back around 3 euros. That's 300% inflation if my calculation is right. The upside? I drank less. Yay, he yawns. Sugarloaf and Christ the Redeemer have also become incredibly expensive. 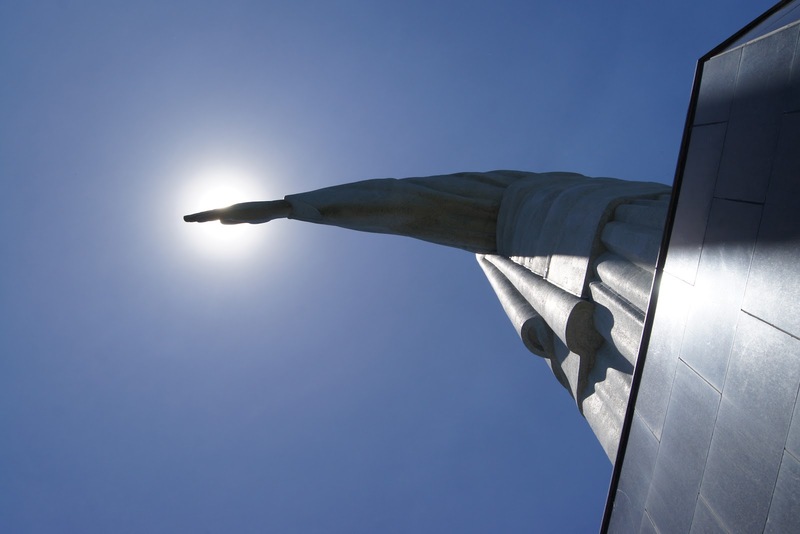 Just getting to the statue that spreads its arms over Rio will cost you one of yours. Taxis charge around 20-25 R$ per person from the Corcovado station, and don't even waste your time haggling. There must be a mafia controlling this concession, because we tried to bargain with ten drivers and every one of them shook his finger at us and drove off. There's also another company that takes vans of people up to the statue. We didn't ask how much they charge. The train was an interesting--but expensive--ride. OK, I see them now! 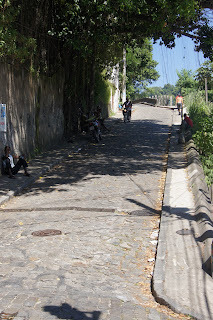 The last time I was in Rio, I walked all the way to the top of Corcovado Mountain; this time, while I was waiting two hours for the next train to the top, I took a stroll to the place where the road diverges and heads up the mountain. As I took this picture of the ascent, six or seven men jumped out of the shadows and started yelling at me. When a couple of them started towards me, I turned away and started back down the hill. Fortunately they stopped when they saw a police car. In a split second, this situation could have turned into another Nice moment. I hadn't even seen them in the shadows. 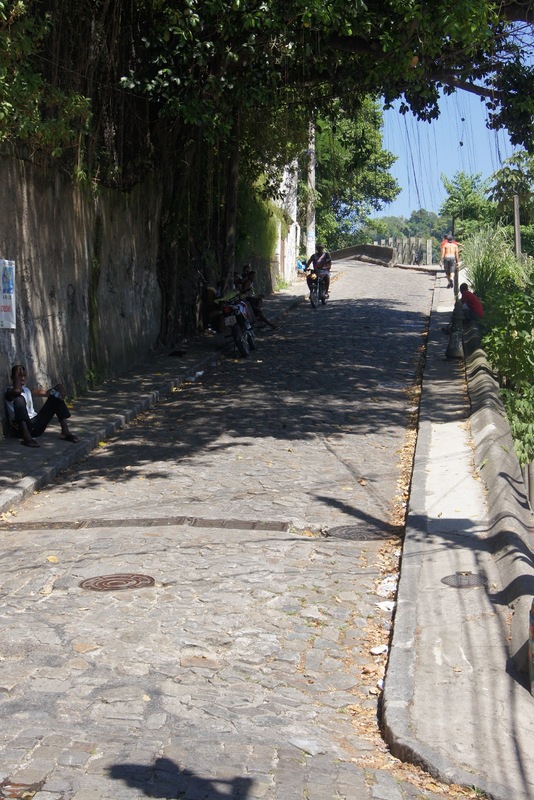 Is walking up Corcovado mountain still safe? We felt safe on the Copacabana and Ipanema. Leblon felt safe. The old town felt safe, but we there in the middle of the day and only for a short time. The sun was broiling, so we spent much of our visit seeking shade. I'm not the beach type. I can't lie in the sun for longer than it takes to drink one caipirinha and eat one batata fritas. 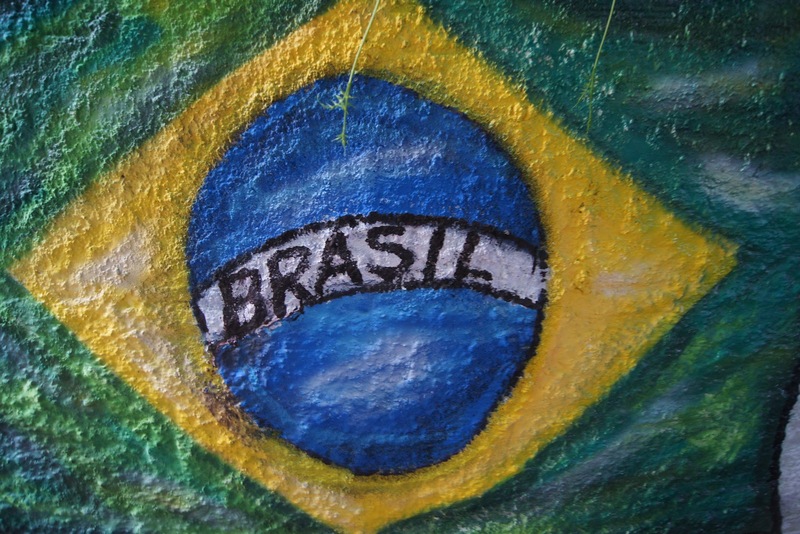 Eating in Brazil for people with Celiac Disease is not as difficult as you might think. For starters, there must be laws now concerning labeling because every packaged food that I saw had either "Contém Glúten" or "Não Contém Glúten" in bold print in the list of ingredients. If you can't eat foods containing gluten, you need the Não Contém Glúten variety. 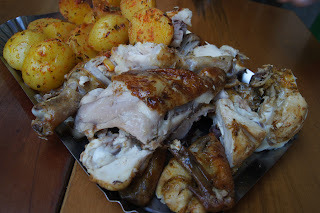 Dishes like the traditional mocequa should be fine if the fish stock they use is gluten-free, but always ask the waiter "Contém farinha de trigo?" I've also found it effective to use the word "allergy" instead of trying to explain Celiac Disease to waiters. "Sou alérgico ao trigo." worked fine in Brazil. Even with my pitiful Portuguese, I was almost always able to make myself understood. The server at the Blackswan pup on the island of Florianòpolis was well informed about Celiac Disease. More on my jaunt through Brazil in the weeks to come. 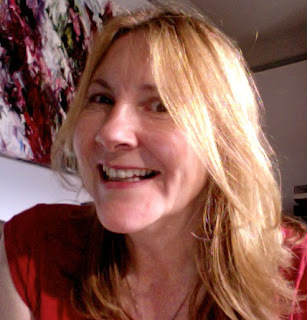 If you have time, Ruth at Tanama Tales has interviewed me about the way I travel. Comments appreciated always HERE. 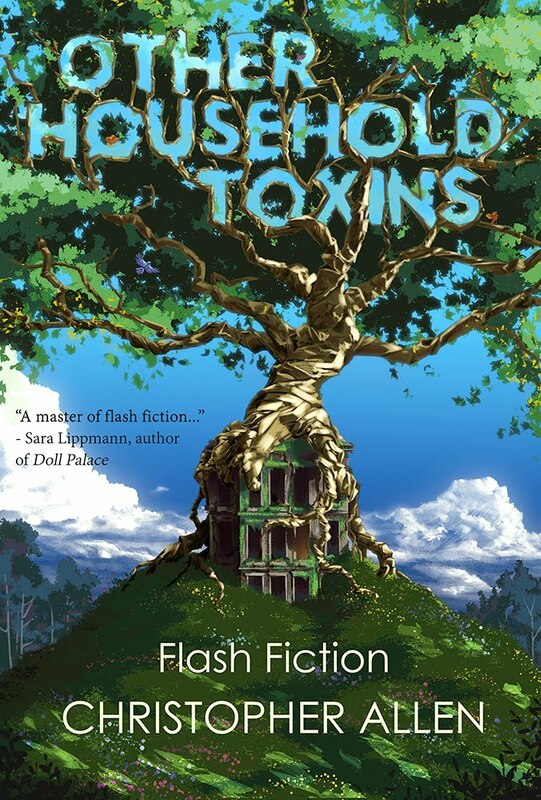 Also, Dan Powell asked me some challenging questions about My Life in Short Fiction. If you want to open this window into my early reading life, go HERE. To continue with I Must Be Off! A-Z, go to S is for Samos. Hey! Thanks for commenting. There are economical ways of enjoying Brazil. Ruth at www.tanamatales.com has posted a good article about how to save money in Rio. so you're past your rough dance club days then? Um, yeah, I think so. I don't think my rough dance club days lasted very long. I think they were more like hours than days. Drooling over the food and drink in this post. Your first experience in Rio sounds a little scary. Glad those 6 or 7 men in your photo didn't pursue their argument with you. I guess they didn't like being photographed. I'm baffled, though. Why don't the police (who are only a few steps away) do something about these men, who are obviously theives. Rio de Janeiro has a problem with organized crime. And it's getting worse.